Like the song says, kids may think you’re just fishing, but parents will discover that fishing with kids is about quality time together. Sometimes household distractions can deter families from discussing these important issues: ballet shoes, kittens, or that cute new boy at school that is always “annoying” your tween. So get out and enjoy some quality time with kids, make some memories and you might even catch a fish or two – and that’s just icing on the cake. Safety comes first. Teach kids how to act safely around water. Establish safety rules, such as no running, wearing float vests, looking before casting, and sticking together. Keep it Simple. There is no need to invest in the latest fishing gear for kids. 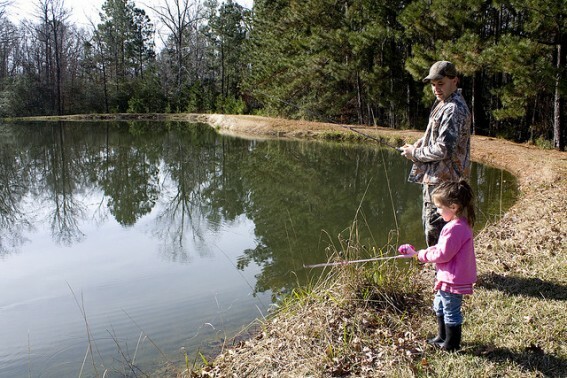 Kids just need the basic equipment; a rod, reel, line, bobber, hooks and bait. I recall my kids catching fish that weighed more than their Sponge Bog and Barbie poles. Quantity not Quality. 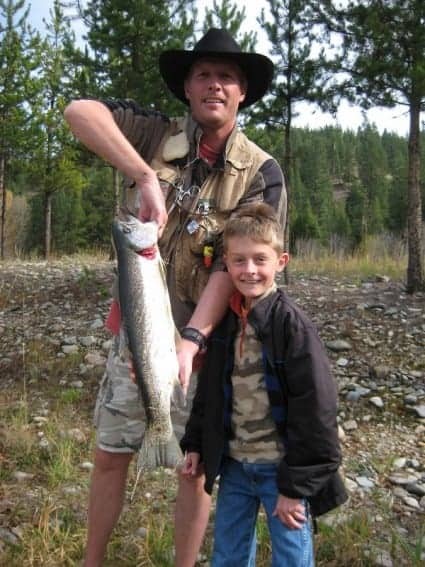 Take kids fishing where they will have the most success catching fish. Look for spots that are regularly stocked with open shorelines to practice casting. These spots won’t necessarily yield a trophy fish. However, kids will be more engaged when the fish are regularly biting. Fish by something else that’s fun. If the fish aren’t biting, it’s always a good idea to be near playground equipment, sport fields and hiking trails. Enjoy Nature. There is more to a pond than the fish you are trying to catch. Roll up your pants, wade in the grassy shoreline and discover a miniature aquatic world. Check out the shorebirds, or watch water bugs hopping on the water’s surface. Teach kids angler ethics and conservation. Understand, obey and teach kids about fishing regulations, including size, type and bag limits. Teach kids how to carefully handle fish they have caught. If you do choose to keep the fish you catch, be prepared to properly store the fish and eat it – don’t let it go to waste. If you choose to catch and release, allow kids to release their own fish. Also, consider smashing the barbs on hooks with a pair of flat pliers. This makes it much easier to unhook a caught fish. Have fun. Keep the atmosphere fun and relaxing. Offer plenty of praise as kids master this new sport. Pack a picnic and make it a day. Most importantly: don’t forget to brush up on your ballet shoes and kitten expertise. Also, be sure to check out these suggestions for even more great community fishing spots as recommended by Trekaroo parents. Leave your own suggestion for a favorite place to fish with kids as well. It would only be fitting to include a typical “big fish story” in a post about fishing with kids, so check out this trophy Rainbow Trout that my 10-year-old caught. The fish was too heavy for my son to lift, so his Dad had to hold it for the picture! If you want to catch a trophy like this one, be sure to read my review of the Alta Ranch in Darby, Montana. *Be sure to watch the music video of the Trace Adkins’ “Just Fishin’” song; it serves as a great tutorial for a successful fishing trip with kids.